In the UK, after the weather, It would appear that property prices cause more discussion and emotion than any other topic. Brits are obsessed with the value of their house, how much equity they have and how it compares to everyone else. There doesn’t appear to be any consistency as depending on what media outlet you read property prices are either soaring or, they are in stagnation or falling. I think we can all agree on one thing and that is how out-of-control prices in London have become. If only I had bought a flat in London 20 years ago etc. etc. The basic rule of property is location; a one bedroom flat in a northern city could be bought for £100k whilst in London you would have to raise £500k to have the same size and specification. Moving North to South is a huge barrier for many when they consider how their modest budget in the north will buy when relocating South. However, if you are moving South to North then you are laughing all the way home to your five-bedroom mansion (after selling a bedsit in Hackney). In the UK (2018), the average house price to salary ratio is now 7.6. The highest ratio is in Chelsea and Kensington, London at 38.5. Copeland in Cumbria is a modest 2.8! In 1997, house to earnings ratio was 3.7 – I can only look back with fond memories and missed opportunity. 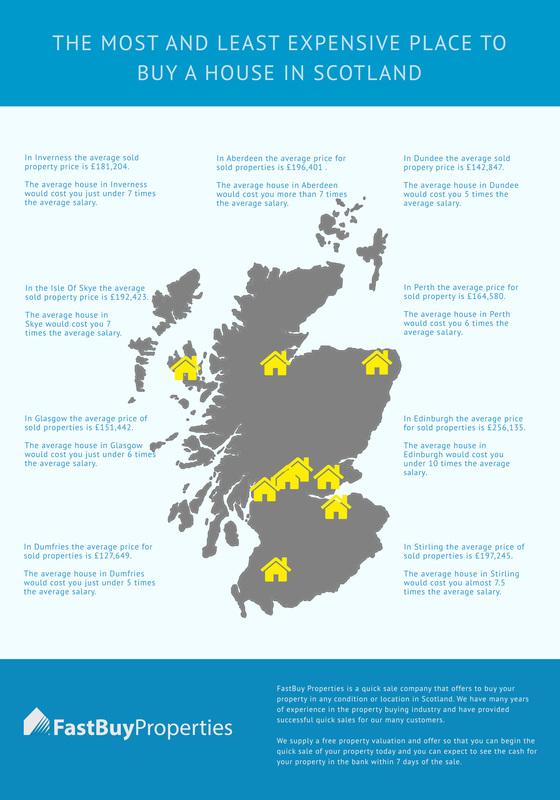 The Most and Least Expensive Places to Buy a House in Scotland infographic covers the hot topic of average house prices in Scotland to offer a regional focus north of the border. This is a piece of content based on the strength of the information being offered and the design does not distract from this. A simple presentation of the facts in a ‘does what it says on the tin’ graphic. The typography is clear and straight forward to read. The focus of the graphic is the map of Scotland that represents the subject. The content has great value and is of real interest. The strength of this infographic from Fast Buy Properties is the interest of the data presented.